Looking for a nearby, affordable and memorable way to spend your honeymoon, or "mini-moon"? Located just 25 miles from Philadelphia and 75 miles from New York City, there are infinite ways to plan your "mini-moon" here in the countryside. 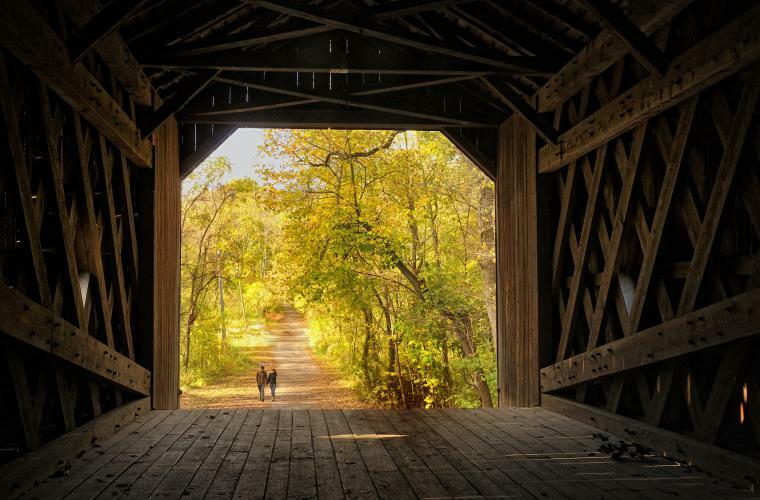 Whether you are looking to whisk your loved one away for a long weekend or just spend your post-wedding getaway close to home, there is something for every couple to enjoy in Bucks County. Stop worrying about crunching numbers and start relaxing and uniting your love in Bucks County. 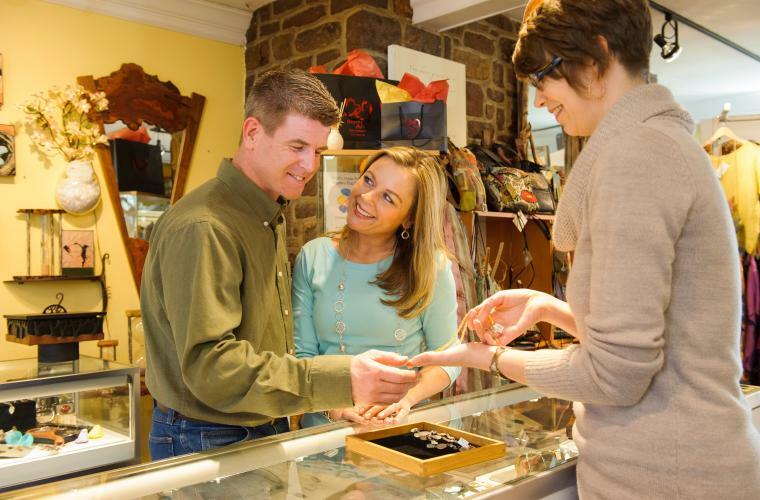 • When you stay in the heart of Doylestown, there are numerous nearby places to explore as newlyweds. Start your day by checking in at the Doylestown Inn located in one of the area&apos;s oldest buildings. This boutique hotel offers 11 elegant guestrooms that will spark the romance between you and your loved one. During your stay, head downstairs to dine on some of the most delicious starters and entrees at the inn&apos;s restaurant, The Hattery Stove & Still, like the Seafood Tagliatelle and Tuna Tartar. • After checking in, you can start your historic "mini-moon" by learning about one of Bucks County&apos;s prominent people of the past, Henry Mercer, at his homestead and museum. Fonthill Castle, Henry&apos;s palatial former home, will win over your hearts with its beauteous detailed architecture. Gaze at the intricate ceilings, walls, and floors that show a display of original handcrafted tiles, produced by Henry in the early 1900s. Make your way next door to a National Historic Landmark where these handmade tiles are still produced in the same fashion inspired by Henry Mercer. At the Moravian Pottery and Tile Works, you can purchase tiles and mosaics to carry on the craftwork of this former American artisan. The history doesn&apos;t stop there! Travel one mile down the road to the Mercer Museum, a six-story concrete castle filled with more than 50,000 early-American artifacts Mercer collected throughout his lifetime. • After your tour through time, take a walk through the remarkable streets of Doylestown where you&apos;ll find The Doylestown Bookshop, the perfect place for second-hand books, records and more. Find a unique read representative of your love for one another to take home. Wind down your "mini-moon" at The Zen Den, only a couple blocks away from the Bookshop and the Doylestown Inn. This trendy coffee boutique offers you a comfortable place to admire and cozy up with your loved one over a hot cup of joe. Become inspired while gazing at various artworks from local artists, hung throughout the coffee shop. • By now, you&apos;ve probably worked up a pretty large appetite that can only be satisfied at the Doylestown Brewing Co. This remarkable pub offers a vast assortment of beer and food options that will not disappoint. Share a beer and raise your glass to a long life, full of love and laughter! Afterwards, end your night at the County Theater, one of the oldest continuously-operated movie theaters in the region, where you and your spouse can enjoy an old-fashioned date night with an age-old film! • Start your "mini-moon" off with an adventurous climb and a bird&apos;s-eye view of the Delaware River and beyond at the top of Bowman&apos;s Hill Tower, located in New Hope. Share a kiss at the top of this 125-foot tower and admire the beautiful 14-mile view of the area. Afterwards, head down into the greenery and visit Bowman&apos;s Hill Wildflower Preserve, just down the road. Experience nature&apos;s extraordinary beauty on this 134-acre preserve. Your love will bloom with the alluring wildflowers springing up in the meadows and pond gardens! • Next, it&apos;s time to hop in the car and take a leisurely cruise through the countryside with the Covered Bridge Driving Tour. Throughout the tour, check out the amazing and unique architecture of the 12 remaining historic bridges located throughout the county, like Cabin Run Covered Bridge. Duck into one of these "kissing bridges" with your sweetheart and steal a kiss or two! • After your drive, head back to New Hope and delight your taste buds with a stop at one of Bucks County&apos;s delectable restaurants. Try the Crab-stuffed Salmon or Chimichurri Caribbean Steak at Havana Restaurant and Bar, located on New Hope&apos;s vibrant Main Street. Treat yourself and your spouse to some of their signature cocktails, like the Chocolate Clover Martini, while you devour a rich dessert. If you&apos;re feeling brave, uncover stories and myths during the Ghost Tours of New Hope, beginning after dark. Hold on to your loved one, because you are in for a fun and spooky night! • After your eventful day, check into Porches on the Towpath for the night. Enjoy the quiet secluded location of this renovated inn and become one with nature on its numerous outdoor porches and quiet outdoor areas. Wake up in the morning to a full country breakfast and walk to all of New Hope&apos;s great shops, restaurants and other attractions. • If you and your newlywed are wine connoisseurs, then there&apos;s no better way to kick off your mini-moon than with trip along the Bucks County Wine Trail. Gain knowledge on the craftsmanship behind the area&apos;s best wines, right from the owners themselves! Head all the way up north to Upper Bucks County and taste wine fit for a king in a beautiful castle at Sand Castle Winery, join a fun wine pairing event in Central Bucks County&apos;s Crossing Vineyards and Winery and taste the passion behind each of the wines at Wycombe Vineyards. Plan out your perfect trip using this full itinerary! • Not too far from Sand Castle Winery, you will find a warm romantic, waterfront view that is sure to make your love kindle. At the Golden Pheasant Inn Restaurant, your love will illuminate along the Delaware River as you dine and savor some of the finest foods, like Wild Alaskan Halibut with a side of sweet red wine. Let this lovely inn be your escape with your loved one as you experience the countryside of Bucks County. • The notable and charming town of Lahaska offers a distinguished collection of restaurants. If you love Italian food, then your mouth will water over the savory entrees offered at Villaggio Italian Restaurant. You and your loved one will surely be gratified during your dining experience at this Southern Italy-inspired restaurant. If you&apos;re looking for something fresh head over to Caleb&apos;s American Kitchen where the food is made with ingredients grown by local famers. Bring a bottle you picked up during your travels on the Bucks County Wine Trail to pair perfectly with your meal from this BYO restaurant. • After dinner, satisfy your sweet tooth with the limitless options of candies at Skip&apos;s Candy Corner in Peddler&apos;s Village. Please your palate with fudge, gourmet pretzels, caramel chocolate apples and many more rich options. Save time to walk along the beautiful brick pathways throughout this 18th-century-style shopping village and pop into the variety of chic shops that line the streets. • Rest your head for the night at the on-site Golden Plough Inn, a B&B uniquely designed for your comfort to ensure a romantic getaway. Stay in the inn&apos;s beautifully appointed rooms that create a Colonial-esque atmosphere with modern amenities. During your stay at this timeless inn, you&apos;ll receive a complimentary continental breakfast at the neighboring Buttonwood Grill, which includes bakery assortments, sandwiches, and fresh fruit. Your "mini-moon" doesn&apos;t have to end here! Extend your romantic escape by discovering more unique places in Bucks County to call your own and create lifelong memories with your sweetheart.